I was listening to a techno-rap song called "Cowboys & Aliens" by Gram Rabbit while driving around town on a hot day (and I mean really hot – I live in Tucson!). There was something about the song and the dry heat that set my imagination to thinking about what if the conspiracy theorists are right? What if there really was a crash in Roswell in 1947 and they recovered alien bodies as well as debris? And what if there really is an underground lab where they created and keep alien-human hybrids? And what if one escaped? 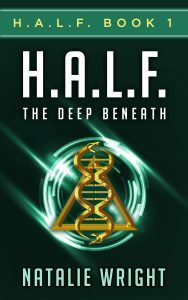 From that general idea grew a 3-book series, H.A.L.F. (Human Alien Life Form). Book 2, The Makers, released this past May and book 3 will release sometime in 2017. Erika Holt, the main female character, was a reaction to the main character (Emily Adams) of my first series (The Akasha Chronicles). Emily was a girl that lacked confidence in herself and cared (too much probably) what others think of her. Erika is very different. She's got confidence all over the place! She knows who she is and doesn't give a flying fig what others think of her. I wanted to create a female character that's a reluctant hero. I was inspired by Clint Eastwood's character in "The Good, The Bad, and The Ugly." I was going for reluctant hero but someone who is good at heart and despite not wanting to get involved, will do the right thing and always has the back of her friends. H.A.L.F. 9 was a considerable challenge. My first crack at the character was a bit too android. My second shot he came out a bit too "Paul" the alien. The final #9 character is, I hope, a bit more like the Man from Mars in "Stranger in a Strange Land" than Paul. Commander Lillian Sturgis (aka Dr. Sturgis) was another fun character to create. Commander Sturgis is in command of A.H.D.N.A., the underground lab where #9 has been kept. Sturgis believes that aliens – the ubiquitous Roswell Greys – are going to attack us; that the human race is at stake. So she believes that everything she does is for the greater good. My goal was to inject some moral ambiguity regarding Sturgis. She is the antagonist to both #9 and Erika. But is she a "bad guy"? Or is she a "good guy"? Readers may not be sure how they feel about her until the very end of the series.